Most golfers especially amateurs hold the golf club in their palms and not in the fingers. Fingers are by far more sensitive than the palm and hence give a stronger grip. Placing the club in the fingers and not in the palm creates a better wrist hinge thereby resulting in more feel and longer tee shots. In addition to this, fingers are more flexible thereby making it easy to maneuver a good swing while still gripping the club strongly and perfectly. This enables you to make pro-tee shots like Hank Haney. If you have watched a golf grip tutorial video you will notice there is emphasis on applying light grip pressure on the club. Holding the club too tightly strains the hand and the wrist thereby making it hard to make a smooth swing and perfect tee shot. At times, if you apply to much grip pressure on the wrist, you can hurt your wrist and shoulders particularly when making a full swing. People have different hand sizes and as such, it is only right to use a grip size that is suitable for your hands. The easiest way to know if the grips are correct is checking if when you grip the golf club in the lead hand, the fingers touch the pad of the hand under the thumb. If the grip size is right, the fingers should barely come into contact with the hand’s pad under the thumb. 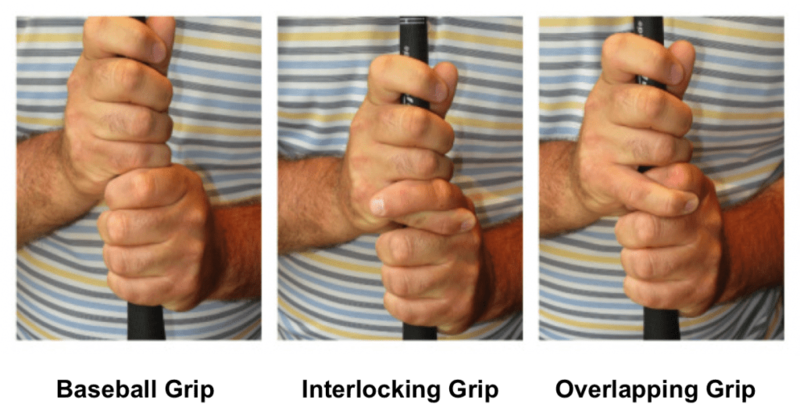 In this grip, the golfer uses all the 10 fingers in the grip and the club is held in the fingers. This grip is a favorite option for young juniors and women golfers. This is a one of kind grip whereby golfers interlock the pinkie of their trail hand using the index finger in the lead hand. This type of grip is common among players with small hands as it enables them to have a stable grip during full swings. This is a grip for pro-golfers. The pinkie/little finger on the trail hand is used to overlap the pointer/index finger in the lead hand. The best thing about this grip is that it is ideal when making long tee shots.